Economic recessions present major burdens to the nations who face them. During these downturns unemployment rises, household incomes fall, and gross domestic product (GDP) is reduced. Investment spending and corporate profits drop and the price level begins to fall, sometimes bringing forth a threat of deflation. Typically recessions last for only a short period of time, but sometimes the collapse is so devastating the effects are widespread and persist for many years. While Japan’s asset collapse in the late 1980’s and early 1990’s draws many parallels with the United States Financial Crisis in 2008, the two calamities also had many stark differences. It is important to note that most literature discussing Japan’s asset bubble comes from a pre-2008 perspective. As a result, policy decisions made in Japan are often compared to those in the United States. These comparisons assume the United States was not headed toward a housing bubble of its own. This distinction is crucial because financial liberalization itself is seldom blamed for the asset bubble in Japan. the longest recession in the United States since the Great Depression (Business). This “Great Recession” as much of the media and populace like to term it, brought about massive unemployment, a continual reduction of the United States GDP, and general panic about the future of the country’s economy. Although national output has since rebounded from the mid-2009 trough, the unemployment rate remains at a relatively high 9.6% (Labor). The Lost Decade in Japan was a ten to fifteen year period of economic decline or stagnation that occurred during the 1990s, and into the early years of the new millennium. Poor policy decisions following massive growth throughout the 1980s led to a stunted economy, faced with minimal corporate expansion and a large credit crunch. Also, as Japanese citizens began to save the majority of their income, limited cash flow only amplified the corporate struggle of securing funds. The Great Recession and the Lost Decade were both ignited by the expansion and bursting of large speculative bubbles. Leading up to the downturns in both economies, the United States and Japan experienced strong economic growth fueled by increasingly liberal lending practices. Largely due to competition between lenders, creditors began to extend loans to riskier borrowers which led to unsubstantiated purchases in their respective economies. While occurring in a different time period, the speculative rise of housing prices in the United States greatly reflects that of land and asset prices that occurred in Japan in the mid-to-late 1980s. At the end of the Clinton administration the United States was experiencing vast economic growth and prosperity. Not only did the nation witness massive growth of its GDP, but the government also ran a budget surplus for a few years. Household income was rising and people began to invest their earnings into safe, long-term markets such as that for housing. Beginning in 1998, house prices began to rise due to increasing activity in the market. In a speech made earlier this year current Chairman of the Federal Reserve Ben Bernanke stated, “Prices grew at a 7 to 8 percent annual rate in 1998 and 1999, and in the 9 to 11 percent range from 2000 to 2003… the most rapid price gains were in 2004 and 2005, when the annual rate of house price appreciation was between 15 and 17 percent” (Bernanke). During that period, the rapid growth of the housing market was often justified as a product of the prosperous times, however many experts now claim the inflated prices were a byproduct of subprime lending and poor regulation. As property values rose in the United States, so did the attractiveness of securing a mortgage to purchase a home. Houses were considered to be a safe investment with the potential for significantly high rates of return due to the ever-increasing prices. From a homeowner’s perspective, renting seemed illogical because one could always sell a house for a return on investment if times got tough. Simultaneously, in an effort to capitalize on profit maximization, banks began to extend loans to less-qualified individuals with houses being collateral for repayment. This practice continued to thrive especially as new devices were invented to offer banks loan security against these borrowers and spread the threat of loan defaults to third-party investors. As John Cassidy states Keynes’s view, “In the short run, prices may move further out of line with fundamentals, causing them (investors) to make even bigger losses. Following the herd, even when you believe prices have become disconnected from reality, cannot be described as ‘wrong-headed’” (172). Few believed house prices would collapse, and even investors who believed prices were inflated did not want to sit out while others profited on the bubble. Banks continued to lend to risky borrowers and investors continued to buy mortgage-backed securities, all for the purpose of increasing profits and not lagging behind competitors. When a bubble is on the upswing nobody can lose, but the effects of a collapse can be devastating. Like in the United States during the late-1990s to early-2000s, Japan’s growth in the 1980s was largely due to increased land and asset values. According to the Land Price Index, Japanese land values reached their peak in 1990; also, the Tokyo Stock Price Index shows a peak in the aggregate numbers for all stock-exchange-listed firms arriving in 1989 (Goyal & Yamada 179). Many experts attribute the proximity of peaks in land and stock values to a cycle of corporate borrowing, which was driven by easy monetary policy. Vidhan Goyal and Takeshi Yamada note, “The beginning of the asset inflation period coincided with the Bank of Japan adopting an easier monetary policy. The official discount rate fell from 5% in 1986 to 2.5% in February 1987” (180). The lower interest rate encouraged corporate borrowing from banks in an attempt to expand production capabilities. Upon obtaining these loans corporations bought up large quantities of land, raising both property values and the prices of their stocks due to expectations of higher future earnings (Bordo & Jeanne 7). With the corporations now highly collateralized, the rate of lending continued to increase and the economy’s growth rate followed. Japanese lending in the late-1980s was similar to the United States during the early-to-mid-2000s. Initial borrowing was limited to strong corporations and wealthy individuals with high expectations of repayment. The rise in stock prices brought about by increased land values led to the extension of loans to riskier borrowers, however. Soon, much of Japan’s growth was based on the speculative escalation of land and stock values. Also, much of the collateral backing new loans in the late 1980s was funded by previously borrowed money; this fact increased the risk of default and fed the speculative boom in various sectors of the Japanese economy. The increased value of corporations, despite coming from borrowed funds, enhanced their creditworthiness to banks that then approved higher-value loans. This practically ensured a bubble. Japan’s economic success during the bubble can be attributed to euphoria and unsubstantiated expectations for the future (Okina & Shiratsuka 37). Just as corporations were able to use borrowed funds to enhance collateral, Japanese banks were similarly given the right to use outstanding mortgage receipts as part of their capital requirements. In 1988, the world’s foremost economic leading countries met in Basel, Switzerland to determine, for the first time, an international standard for capital asset requirements. These standards would be binding for the top 10 economic countries (G-10) and many smaller countries would follow them voluntarily. The members of the Bank of International Settlements (BIS) agreed to let Japanese banks use part of their hidden assets as capital for their lending. As stated by Thomas Cargill, “The final requirement permitted Japanese banks to meet the 8 percent risk-adjusted capital requirements by including 45 percent of hidden reserves in tier 2 capital” (88). Including this 45% as part of their capital requirements allowed Japanese banks to have substantially higher leverage ratios. In addition to these perverse incentives, Japan also lacked many of the regulatory institutions to police bank activities. The Deposit Insurance Corporation (DIC), the Japanese equivalent of the FDIC, played no substantive role in the regulation of banks. The DIC, which had a total staff of about ten people, had a limited amount of cash reserves that would be erased by the failure of even one regional bank and implicitly stated that it would insure all deposits regardless of the amount (Cargill 86). In the United States, the interconnectedness of large financial institutions magnified the size of the collapse. Derivatives allowed companies to hedge their risky investments, but the firms who issued derivatives, like AIG, were not required to hold capital in reserve to cover those derivatives. So when the risky investments depreciate below a given value, the issuers had an insufficient amount of capital to fulfill their contractual obligations. In addition, these derivatives were not traded publicly, which prevented stock holders from fully understanding the true financial state of their companies. The lack of transparency in both the United States and Japan is probably what connects the two crises the most. In Japan, the actual capital was kept secret while in the United States it was a different form of insurance that was secret. At the consumer level, there existed similarities as well. Instead of using teaser rates and subprime loans as the United States did “Japan had its own versions of [risky] loans, including the so-called three-generation loan, a 90- or even 100-year mortgage that permitted buyers to spread payments out over their lifetimes and those of their children and grandchildren” (Fackler). In hindsight this type of loan seems unreasonable, but in a country that was accustomed to an unemployment rate below 3% the credit worthiness of the next generation seemed high. 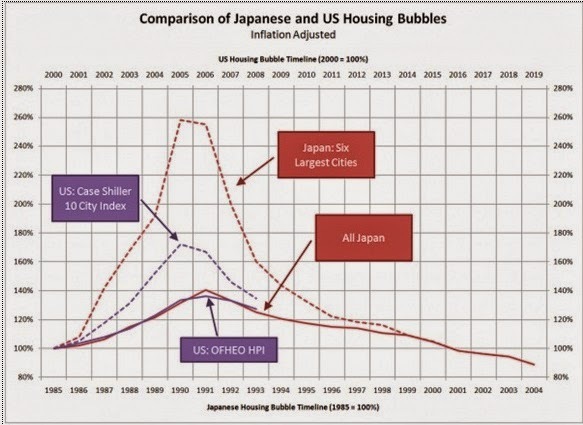 Leading up to the collapse, Japan’s housing bubble grew significantly faster than the United States bubble did. In 1991 all the land in Japan, which is about the size of California, was worth around 18 trillion US dollars. At the time, all the property in the United States was worth around 5 trillion dollars (Fackler). When the Japanese government realized they were in a full blown bubble the central bank significantly raised the interest rate in order to discourage lending. This promptly burst the housing bubble, and property and stock values plummeted. As of 2005, land prices in Japan were worth half as much as their 1991 peak values. Meanwhile, the value of real estate in the United States tripled. As seen in the graph below, the effect in cities was even greater. During that 14 year period Japan’s six largest cities experienced a 64 percent drop in residential housing prices (Fackler). Housing prices in the United States have yet to stabilize. Although their decline has been softened by tax incentives and low interest rates, the surplus of foreclosures currently on the market is proof enough that the plunge is far from over. Japanese housing prices did not fully reach bottom until 15 years later in 2005 but they turned down again in 2008. If the decline in prices lasts a similar length of time in the United States housing prices won’t consistently rise again until after 2020. Unlike Japan’s government, the United States did not burst its own bubble with a large increase in interest rates. Instead the United States’ bubble began with the homeowners being unable to pay their mortgage obligations. While housing prices had skyrocketed, median income in the United States barely moved from 2000 to 2007. As a result, homeowners were unable to repay their loans. During the boom, financial institutions used mortgage securities as collateral for short term lending. In turn, they used this short term lending to finance everything from payrolls to long term investments like car loans. When the short term lenders (money market funds), realized that the securities were riskier than previously thought, they demanded much more collateral for short term lending. What ensued was a sudden lack of short term credit that forced companies to lay off workers in order to balance their budgets. In contrast to Japan, the United States quickly lowered interest rates to try and free up credit. Early on the Federal Reserve saved Bear Stearns from bankruptcy because it was the first institution to go to the brink of failure overnight. Lowering interest rates to near zero was hardly enough to compensate for the sudden lack of credit. Soon Leman Brothers approached bankruptcy and when efforts to negotiate a buyout failed, the large firm filed for bankruptcy. A Domino effect quickly ensued. The collapse was driven by both the debts of Leman Brothers to multiple firms, including a money market fund that also declared bankruptcy, and by the sudden lack of confidence that results when a major firms declares bankruptcy. At the peak of Japan’s crisis, the government had just raised interest rates. It took the government about 5 years to get the discount rate and the interbank rate to almost zero from 6% and 8% respectively (Cargill 96). While the United States quickly lowered their interest rate to zero, neither countries’ monetary policies solved the ensuing recession. Recessions are largely defined by the unemployment rate. While GDP growth is the technical determinant of a recession, the unemployment rate is the standard by which the public judges the health of the economy. For this reason it is important to examine the unemployment rates of Japan and the United States in their post asset bubble economies. The unemployment rate in Japan has historically been very low, usually remaining under 3 percent. Economists believe there are two major reasons for this: methodical and definitional differences and Japan’s employment system as compared to that of the United States. On the other hand United States’ unemployment statistics record a person outside of the labor force if they made their last job search over a month ago while in Japan they are considered unemployed members of the labor force. It is essential to note that many economists believe these differences in calculations are not the main cause in the varying levels of unemployment in the United States and Japan. Commonly, the more important cause of Japan’s low unemployment rate is thought to be the structure of the labor market itself. The Japanese labor market is more stable than that in the United States because many companies offer their employees long-term employment, sometimes guaranteed to retirement. Therefore job changes are less likely to occur in Japan than in the United States. Japanese workers tend to have the same job for an average of 12 years while the average tenure for workers in the United States is only 7 years. Furthermore, 50% of the Japanese workforce tends to hold a job for longer than 10 years while the majority of workers in the United States hold their jobs for an average of less than 5 years (Vollmer 299). Another factor that plays an important role to the low unemployment rate in Japan is its rigid real wage and bonus system. The amount of a worker’s bonus depends on the success of the last six months of the company’s activity; worker compensation based heavily on bonuses prevents major deviations in the real wage. For instance, if there is an increase or decrease in productivity then workers will receive respectively more or less in bonuses while the real wage stays at the same level. This system allows Japan to handle external economic shocks without a rise in unit labor costs and unemployment. Conversely in the United States wage is adjusted annually so when facing cases of adverse shocks the unemployment rate goes up because companies start to lay off their workers. Prior to the collapse of the asset bubble the Japanese labor market was working extremely well, with the unemployment rate below 3% for a period longer than 30 years. However, in the early 1990s the unemployment rate started to rise. The Japanese economy experienced stagnation for approximately the next 10 years and its unemployment rate remained higher than normal, around 5%. In comparison, the United States’ unemployment rate historically averages between 5-6%, but due to the recession experienced rates over 10% at times (Cargill 6). The financial crisis in the United States unfolded much quicker than Japan’s crash in the 1990s, and brought harsher results to the labor force as well as national output. Recently China surpassed Japan and became the second largest economy in the world. Up until then, Japan and the United States had been the two largest economies in the world for decades. In that light, it is perhaps not that surprising that both countries succumbed to irrational optimism about their housing markets. While the lead up to and the collapses themselves are unmistakably similar, ultimately the similarities of the crises will be judged by the speed at which the United States recovers. Unfortunately, if Japan’s struggle gives us any insight to the future, the United States will not experience a substantial recovery for a long time. Bernanke, Ben S. (2010, January). Monetary Policy and the Housing Bubble. Speech presented at the Annual Meeting of the American Economic Association, Atlanta, GA. Retrieved November 9, 2010, from http://www.federalreserve.gov/newsevents/speech/bernanke20100103a.htm?source=myrealestatemoney.com/RENEWS. Bordo, Michael D. & Jeanne, Olivier. (2002). Boom-Busts in Asset Prices, Economic Instability, and Monetary Policy (NBER Working Paper 8966). Retrieved November 2, 2010, from http://www.nber.org/papers/w8966. Business Cycle Dating Committee, National Bureau of Economic Research. (September 20, 2010). Retrieved November 8, 2010, from http://www.nber.org/cycles/sept2010.html. Cargill, Thomas, and Takayuki Sakamoto. Japan Since 1980. NY, NY: Cambridge University Press, 2008. Cassidy, John. How Markets Fail: The Logic of Economic Calamities. New York: Farrar, Straus and Giroux, 2009. Fackler, Martin. "Take It From Japan: Bubbles Hurt." New York Times 25 Dec 2005: http://www.nytimes.com/2005/12/25/business/yourmoney/25japan.html?scp=1&sq=Japan%20housing%20bubble&st=cse. Print. Goyal, Vidhan K. & Yamada, Takeshi. (2004). Asset Price Shocks, Financial Constraints, and Investment: Evidence from Japan. The Journal of Business, 77(1), 175-199. Retrieved November 4, 2010, from http://www.jstor.org/stable/3663756. “Labor Force Statistics from the Current Population Survey.” (n.d.). Bureau of Labor Statistics. Retrieved November 9, 2010, from http://data.bls.gov/cgi-bin/surveymost. Okina, Kunio & Shiratsuka, Shigenori. (2002). Asset Price Bubbles, Price Stability, and Monetary Policy: Japan’s Experience. Monetary and Economic Studies, 20(3), 35-76. Retrieved November 4, 2010, from http://www.imes.boj.or.jp/english/publication/mes/2002/me20-3-2.pdf. Vollmer, Uwe. "Reason for Japan's low unemployment rate." Intereconomics. 23.6 (1988): Print.